27 FEBRUARY 2019, BRUSSELS, BELGIUM. 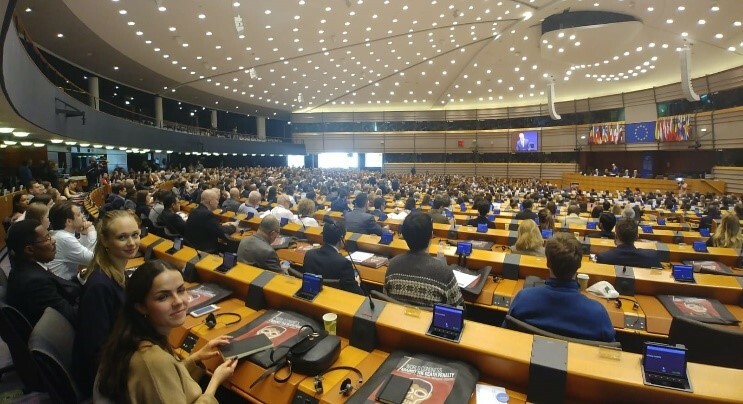 –On Wednesday morning, World Youth Alliance Europe (WYAE) attended the 7th World Congress Against the Death Penalty in Brussels’s European Parliament. The congress was organized by the World Coalition Against the Death Penalty Alliance, consisting of more than 120 NGOs, associations, local authorities and unions. The primary purpose of the World Congress is to abolish the death penalty worldwide. Participants from all over the world came to join the event. Among the invited speakers, government leaders, politicians, even former death row prisoner and many talented artists attended from all around the world, affirming their support and commitment to protecting human dignity. Highlighting the importance of the Congress, even Pope Francis sent a personal video message addressed to the participants. The death penalty is the most serious form of punishment; once carried out, it cannot be undone. It follows that the legitimacy of the death penalty is one of today’s most controversial legal, ethical, political and social issues. The first World Congress Against the Death Penalty was held in 2001. As of today, more than 140 countries are abolitionist. This is more than double the number of countries which still retain the death penalty. Every European country except Belarus has abolished the death penalty based on the recommendations of the United Nations. However, the fight against this kind of punishment continues in a number of countries. It was stressed during the Congress that the capital punishment may never be the solution for any crime and every country should encourage other State Parties to abolish it. The World Youth Alliance believes that every human being has intrinsic and inalienable dignity that begins at conception and ends at natural death. The dignity of the human person must be always protected by law and saved in all levels of society. Therefore, WYA supports the conclusions of the World Congress Against the Death Penalty and strongly condemns this practice around the world.